Many shapes and sizes! 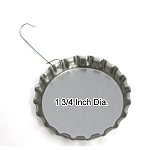 We offer wholesale price breaks on our oversize caps too! 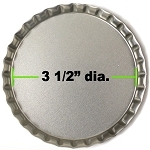 The Jumbo Bottle Cap measures 1-3/4" across the top. 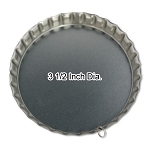 The Super Jumbo Cap measures 2-3/4" across the top. 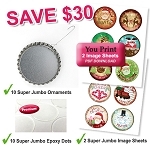 Try these large caps for key chains, photo and/or scrapbook style Christmas ornaments. They also make a great paper weight or coaster -- a fun gift for kids to make! 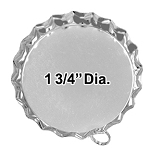 Seal your design with Crystal Lacquer or our 1-3/4" Epoxy Dot and 2-3/4" Epoxy Dot. Both are quick and and easy. 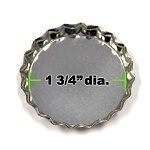 We now sell 3/4" Wide x 1/8" Magnets that work great with our Jumbo, Super Jumbo & Super Duper Jumbo Bottle Caps.